*Seats are limited, all the reservations are confirmed by first-come-first-served basis. NO Late application will be accepted. Ping Chau, or Tung Ping Chau to differentiate from Peng Chau, sits in Mirs Bay of the northeastern waters. It is the easternmost outlying island of Hong Kong. This crescent-shaped island, measuring 600 metres long and 200 metres wide, is renowned for strange rock formations. Unlike most other rock types across the territory, the island is made up of sedimentary rock including siltstone, dolomitic siltstone, mudstone and chert. This sedimentary rock strata is known as Ping Chau Formation. Many extremely well preserved fossils have been found within the formation. Fossil studies, investigations of rock properties and regional geophysics, as well as research in climatic changes during ancient times have confirmed that this formation is the product of sedimentation which took place in Early Tertiary. Layer upon layer of rock form a bewildering structure. The strata looks just like a huge book, guarding great mysteries of geological history within its numerous pages. 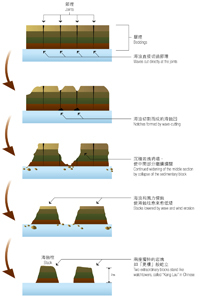 Since no sediments after Early Tertiary have successfully solidified into enduring rock, Ping Chau Formation is the youngest rock in Hong Kong's geological history. Tung Ping Chau is a popular holiday destination. Its many fascinating attractions, such as wave erosion landscape, the shale that resembles a layered sponge cake and the unusually flat lay of the island itself, have drawn thousands of visitors to the island. Three flats are flat sea, flat island and flat rock. Tung Ping Chau is only 1.1 square kilometres in size. An island of extremely low elevations, it really lives up to its name. The highest point in the southeast, Hok Ngam Teng, rises a mere 48 metres above sea level, while the highest peak in the northwest, Au Kung Shan, is only 37 metres. As for the wonder, it refers to the famous shale. This is the most significant characteristic of shale. Every layer is 1 to 5 mm thick. Overlapping each other, the coarser-grained siltstone layers and the finer-grained mudstone layers have clear lamination and sophisticated structure. These shale beds are believed to date from Late Cretaceous to Early Tertiary. It is a safe guess that Mirs Bay and Tung Ping Chau were a remote salt lake detached from land. As a result of sedimentation over long ages, shale resembling a layered sponge cake emerged in the hypoxic, highly salt and still water. Shale is usually made up of pyrite, geolite and augite. The vivid colours come from micrograined calcium, iron and magnesium particles that the rock contains. After formation, the rock was exposed to weathering and wave action, creating eye-dazzling plum, ochre, charcoal and bottle-green outcrops. Close observation will reveal vague or faint ripple marks in every layer. We can thus infer that the rock was close to the lake surface or submerged in relatively shallow water at the time of formation. In such setting, even small ripples would leave detectable marks. 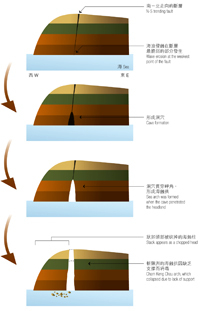 At Chau Mei Kok, you can find vertically fused or dotted reticulation on the shale sections caused by emulsion. 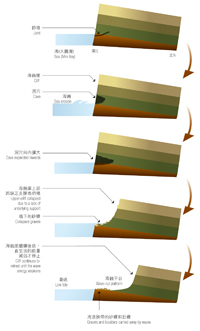 As shale has high calcium content, when it is subjected to tidal, wave and sea current erosion, as well as impacts of salinization, wind, sun and rain, it develops melted calcium sections similar to stalactites. Later when the melted calcium is released, it flows out vertically at the outcrop tips or agglomerates into visible dotted reticulation. This is called vertical emulsion. Ping Chau Formation is made up mostly of thinly-bedded dark grey siltstone and dolomitic siltstone and mudstone. There is also a bed of chert which is 500-800 metres thick. Minerals in the rock include quartz, feldspar, zeolite, aegirine, pyrite and calcite. The presence of dolomitic siltstone, particularly with zeolite and aegirine contents, indicates that the formation was formed in brackish environment in a dry sub-tropical climate. This rock formation consists of thin lamina less than 0.1 cm thick. 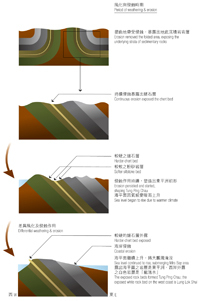 Lamination is extremely fine with visible alternation of siltstone or mudstone sediments and chemical sediments, making it a good environmental indicator. The presence of lamination reflects the rise and fall of lake water level and seasonal salinity variations. The patterned changes in lake water salinity and sediments deposited season after season led to different kinds of sedimentation. In the humid season water level rose and the inflowing water brought larger quantities of silt and mud debris. They settled to form a laminated layer. When the weather was dry salinity increased and there were fewer debris deposits. Chemical sediments formed another laminated layer. Over the ages, these layers overlapped each other and eventually created the seasonal lamination seen today. The significant presence of plant, spore powder and insect fossils within Ping Chau Formation generally points to a history between the Late Cretaceous and Tertiary. As certain plant fossils are unique to the Early Tertiary, it can be confirmed that sedimentary took place during that time. According to consolidated regional geological analysis, Ping Chau Formation most probably rests conformably on red coarse pyroclastic rock of Cretaceous Port Island Formation. Together, the two formations formed a wide open inclined basin in Mirs Bay of the Northeastern New Territories. Crooked Island is an island of Hong Kong located in the north-east of the territory. Administratively, it is part of North District. Crooked Island is located in the west of Mirs Bay. With an area of 2.35 km², it is the largest island in North District, the second largest being Wong Wan Chau (Double Island). Neighbouring islands include: Ap Chau, Ngo Mei Chau (Crescent Island),Pak Sha Chau (Round Island), Wong Wan Chau. The village of Tung O (東澳) is located on its northwest coast. Its highest point is Kai Kung Leng (雞公嶺), 122 m above sea level. Crooked Island is part of the Plover Cove (Extension) Country Park since 1979. Crooked Island Geoheritage Centre at No.142, Kat O Main Street, Kat O, was opened in 2010 by Kat O villagers, voluntary groups and the government to raise public awareness of geo-conservation, as part of the Hong Kong Geopark.